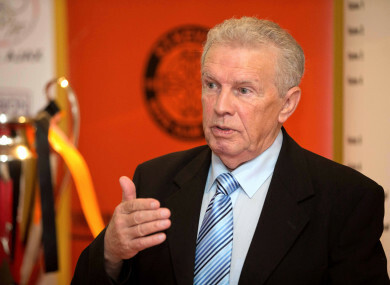 IRELAND AND LEEDS legend John Giles has admitted he was contacted for advice by both FAI CEO John Delaney and the new national U21 coach Stephen Kenny prior to Sunday’s managerial announcement. Giles had recently indicated he was uncomfortable about people knowing about any involvement in the process. “If John Delaney got in touch with me for advice, I wouldn’t want anybody to know about that,” the former RTÉ pundit said. “I wouldn’t want the responsibility. I’ve always said the last thing I’d want in my life is picking a successful manager, and if I was giving information to John Delaney, I would want it to be confidential. However, speaking on The Stand podcast today, Giles confirmed that he has spoken to both Kenny and Delaney in recent weeks. “I know you had a little part in this mediation that was going on. We won’t exaggerate it. It wasn’t a big deal,” host Eamon Dunphy said. Giles added: “Stephen Kenny rang me a couple of weeks ago for a bit of advice, which I gave him. I didn’t hear from him since. I didn’t expect to. John Delaney rang me around a similar time for a bit of advice, as he did many other people, so that’s my part in it. Speaking in relation to the decision to appoint Mick McCarthy initially and Kenny after Euro 2020, Giles added: “I think it’s a good outcome. There might have been a problem of getting Stephen onboard if he hadn’t had this arrangement. “And the main thing, as we saw yesterday on the TV, was that Mick McCarthy is very much in favour of it. If Mick wasn’t happy about it, there wouldn’t be the arrangement in the first place. I think it takes Stephen’s lack of international experience out of the equation now. He’s going to be in charge of the U21s. I’m sure he’s going to have a lot of contact with Mick McCarthy as we go along. Email “'John Delaney rang me for a bit of advice'”. Feedback on “'John Delaney rang me for a bit of advice'”.